Training German Shepherd dogs can be a pleasure and it is most rewarding because these are very smart and loyal dogs. As part of the herding dog group, these canines require a lot of exercise as well as mental stimulation. 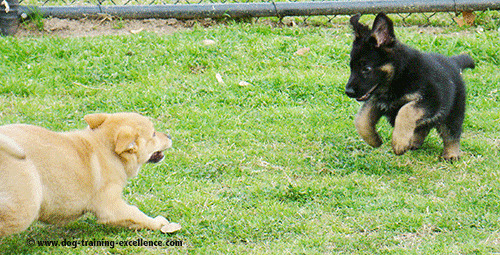 German Shepherd training is key in the development of your dog’s full potential. German Shepherd dogs (or GSD) are often trained for protection, police or military work, service dogs (such as guide dogs) and search and rescue. They have so many jobs because they are on the top 3 list of most intelligent dogs (along with Border Collies and Poodles). Keep in mind that even though they are great guardians and courageous fighters, you should always use positive training methods as well as become a good and confident leader to them. This will strengthen your relationship and make your GSD your true and most loyal best friend. This article will guide you through the first steps of German Shepherd training, take you through some advance work and help you find solutions to common behavior problems. The German Shepherd loyalty can come at a high price if puppies are not well socialized. This breed is known to form a strong attachment to his/her owner, this is great! However, if you fail to socialize your pup they can develop an over-protectiveness that will become a problem. Never remove a puppy from his mother and litter mates before the age of 7-8 weeks. These first few weeks are a critical period in which dogs learn how to be dogs, and only mom and siblings can do that best! Visit the vet and get the first set of required vaccines: these will keep your pup safe and even though your vet might recommend you don’t take puppy out, you should at least take him/her to early socialization and training classes (8 through 12 weeks of age). Actively socialize your GSD at home: the idea is to always make every new interaction positive (with treats, play, attention, etc). Never push your puppy into a situation he doesn’t like, let him approach at his own pace or completely remove him if he shows anxiety and fear. For best results, throw at least 4 parties at your place and invite everyone from babies to kids to adults to seniors to come. Watch sports, grill, play board games, dance or sing Karaoke. Expose your pooch to as many things as possible: objects, sounds, sights, people and animals he is likely to encounter as an adult. Bite-inhibition is another top priority during a German Shepherd's puppyhood period. When correctly done it can prevent serious bites later on. Read our top 10 German Shepherd puppy training tips! Are you crazy about your dog? Find great German Shepherd products at the DogBreedStore to show your love and pasion! German Shepherd training is easier than training many other breeds because these canines need fewer repetitions to learn something new and can learn to discriminate between a big number of different commands. 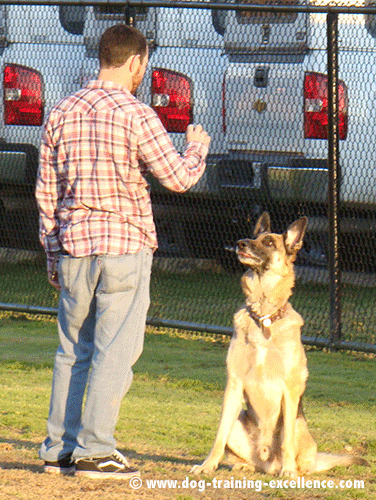 When training German Shepherd dogs stay alert and always offer challenges that will keep your canine’s attention focused on your instruction. Many of the tutorials in this website are written for the average dog, if you feel your GSD is learning faster, then keep up with his pace! You will start by teaching your dog to understand the meaning of “good dog” or any marker word you chose to use. Just say the word and follow it with a food treat - then repeat…repeat…repeat. After some time, you canine friend will associate the marker word with something good and now you can start using this word as a reward itself. This is called Classical Conditioning and is the most basic form or animal learning. Before you start training your German Shepherd commands, it is good to teach him his own name. This is another easy one, say his name and as soon as he looks at you mark and treat! Repeat a lot and in many different situations. Find out amazing GSD facts that will help you better care for your hound. Teach your GSD the following obedience commands, these are basic cues for every day use. If you would like to be even more fancy, you can train these commands using the actual German words! Teach your GSD its name! And find names if you still don't have one too in our over 500 list. German Shepherd Dog Push-Ups: Using the above three cues, ask you dog to follow what you say while you mix and match them. The idea is to keep the order random, that way your smart pooch can’t predict what will be asked of him next, he will need to pay attention to you. Practice these as drills to keep your German Shepherd sharp! Now that your pooch knows some of the most basic and useful commands there is one more thing to do to have a well trained German Shepherd: make those commands reliable! Training German Shepherd dogs in a reliable way means that they will respond to you no matter what situation you are in. Take German Shepherd training to the next level by teaching your dog some advanced concepts. Always remember to keep training sessions short and fun for best results. Remote signals: These are the same cues you have taught your dog before but now you will ask them from a distance. Start only a few steps away from your pooch and keep building up distance as your GSD succeeds. Using hand signals can be very useful for this exercise. Flying drop: This is an advanced down command. While your canine is running towards you, you will ask for a down and he will have to lay down in mid-run! It is a hard one to train, but with practice, patience and smart German Shepherd dogs it can be done. Always start at a level your pooch can succeed before moving on to something more advanced. Protection: This is major decision to make, true protections dogs are trained to be friendly and respond only to the owner, which is often incompatible for family dogs. However, teaching your canine to bark on command (as explained in the link above) can be a good start. You can also teach him to scare strangers that approach you in a threatening way. Training German Shepherd dogs can be really fun and the bond you will create with your canine companion will become even stronger. You can ask questions in the box below and we love to hear stories! You can submit yours following this link.